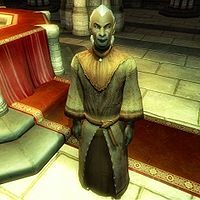 Aron Verethi is a Dunmer priest added as a replacement for Avrus Adas by the Knights of the Nine official plug-in. He will only appear if Avrus Adas is dead (no matter what the cause) at the end of the quest Umaril the Unfeathered. His schedule and services are nearly identical to those for Avrus. In particular, he sells the same spells. He wears a tan robe and a pair of braided leather sandals. He also carries a small amount of gold. Aron doesn't wield any weapons, choosing instead to rely on a set of Restoration spells.